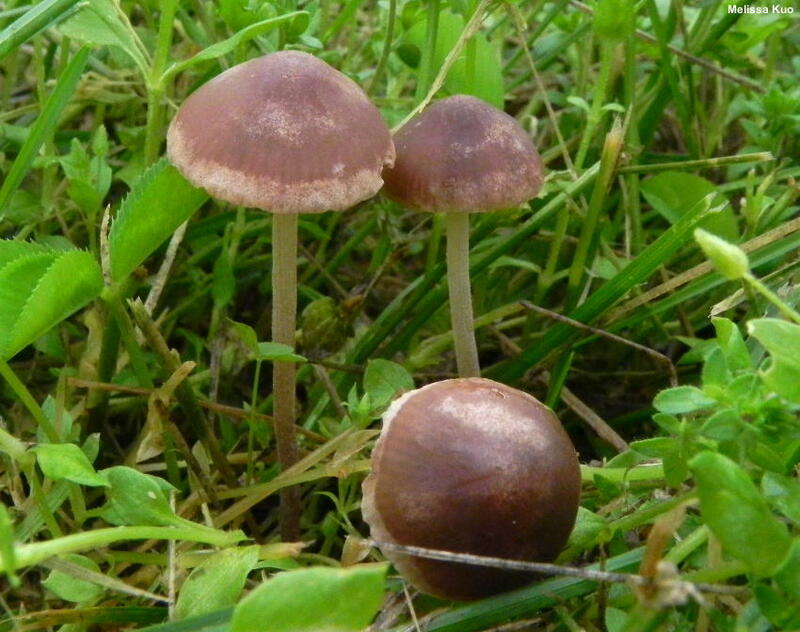 Just about everyone has seen this mushroom, which is sometimes called the "lawnmower's mushroom," at one time or another. 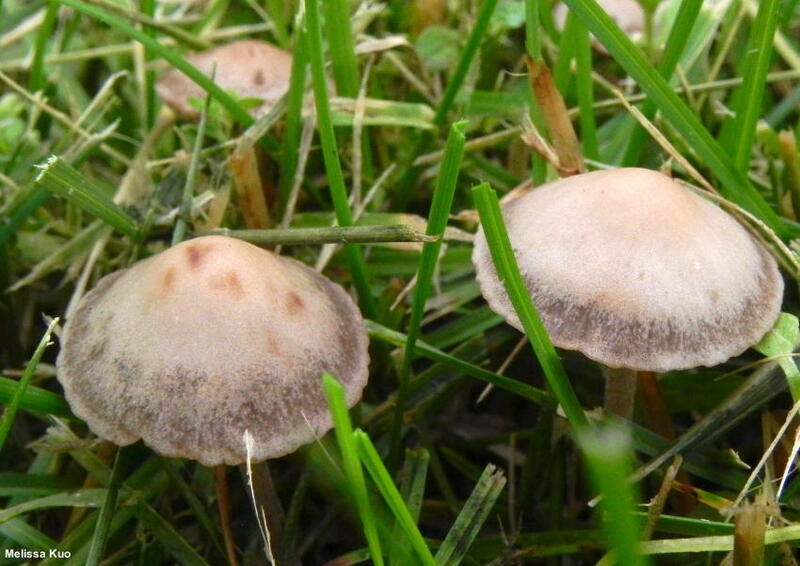 It is one of the most common and widely distributed lawn mushrooms in North America, and it often fruits in large numbers. 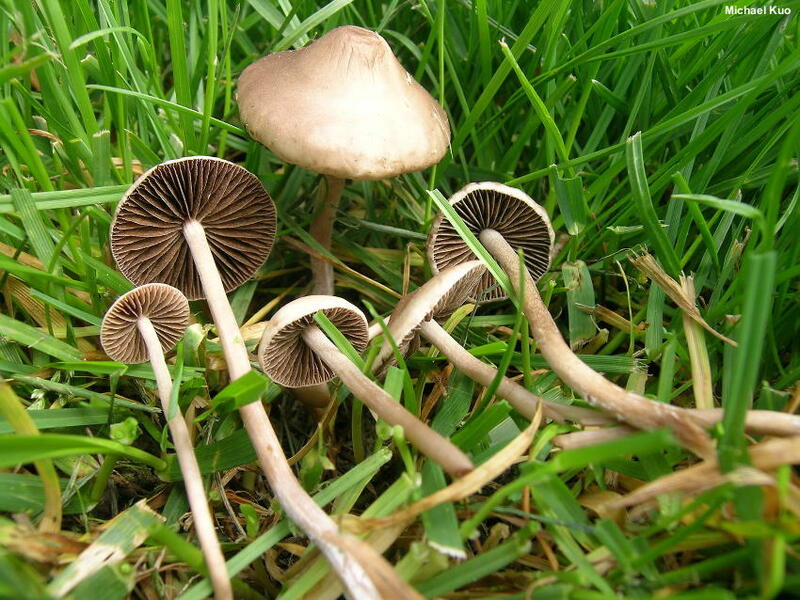 Some people are upset by this; I often receive emails from people wanting to know how Panaeolus foenesecii or some other lawn mushroom can be eradicated. I wonder whether these people would go to BaldEagleExpert.Com and ask for instructions on shooting Haliaeetus leucocephalus? Anyway, the short answer is: you can't get rid of them. If you are worried about mushrooms ruining the appearance of your lawn, I suggest you rethink your priorities in life. But if you are worried about your toddler popping a poisonous mushroom in her mouth, I salute your concern—though you're still not going to have any luck getting rid of the mushrooms. The best solution in this case is to teach your children not to eat everything they see—and if they aren't learning this lesson well, not to leave them unsupervised on your lawn in the summer. 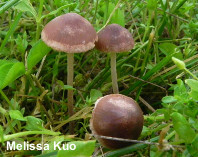 Crucial identifying features for Panaeolus foenisecii include its small size and habitat in grass, along with the dark brown to purplish brown spore print, the lack of a ring or other evidence of a partial veil, and the "hygrophanous" cap: as the cap loses moisture and begins to dry out, its color changes rather dramatically. The result is that one finds many specimens in the process of transforming their colors, with different tones in distinct areas. Panaeolina foenesecii is a synonym. 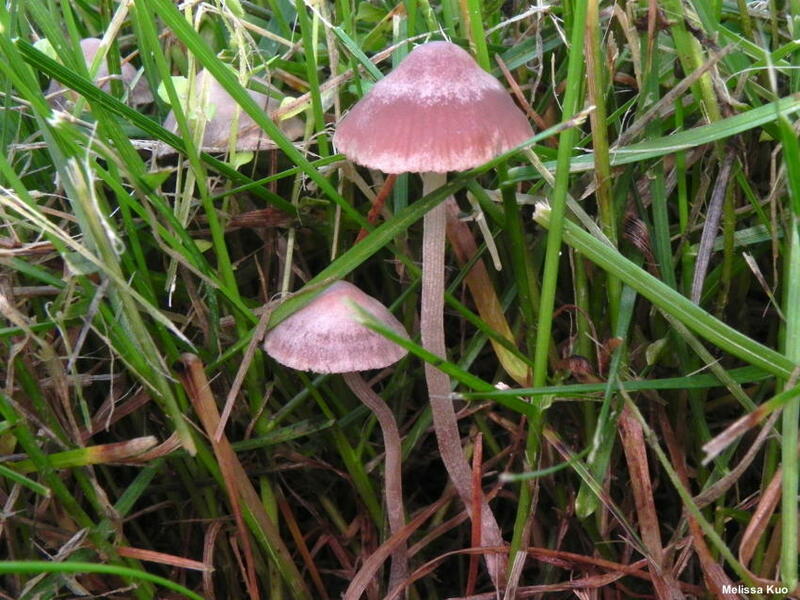 Ecology: Saprobic; growing alone to gregariously on lawns, in meadows, and in other grassy areas; widely distributed in North America, but apparently less common in the southeastern states (judging from online herbarium records); late spring, summer, and fall, or over winter in warmer climates. The illustrated and described collections are from Illinois. 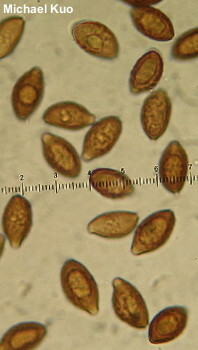 Cap: 1–3.5 cm; widely conical or bell shaped, becoming convex or nearly flat; bald; hygrophanous (see comments above); dark brown, changing to pale grayish brown, tan, or buff—or with bands of these shades when in the process of drying out; often splitting radially with old age; the margin becoming finely lined. 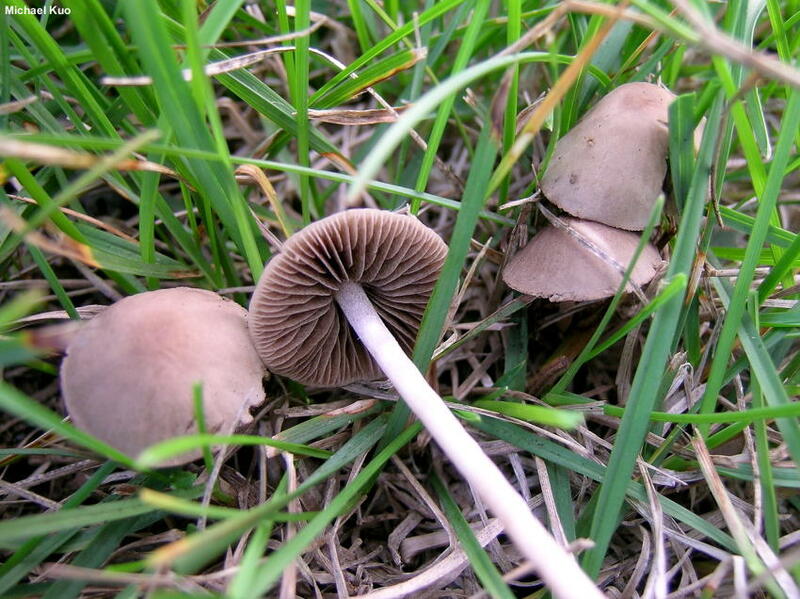 Gills: Narrowly attached to the stem; close or nearly distant; short-gills frequent; grayish to brownish at first, becoming darker brown; sometimes with a mottled appearance; sometimes with pale edges. 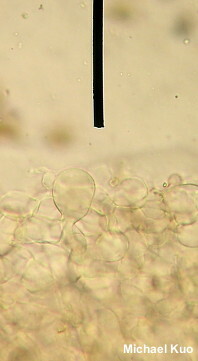 Stem: 6–10 cm long; 1.5–3 mm thick; more or less equal, or tapering slightly toward the base; when fresh and young often finely ridged with longitudinal lines of whitish flocculence, but soon becoming bald; white when young, becoming whitish toward the top and brownish to brown below; fragile; hollowing; basal mycelium white. Flesh: Thin; brownish; unchanging when sliced. Chemical Reactions: KOH on cap surface grayish to negative. Spore Print: Dark brown to purple brown or nearly black. 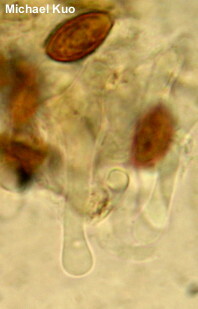 Microscopic Features: Spores 13–18 x 7–10 µm; subamygdaliform; with a large pore (2 µm); verrucose; reddish brown and uniguttulate in KOH; dextrinoid. Basidia 4-sterigmate. Cheilocystidia 25–65 x 7.5–10 µm; cylindric to sublageniform; flexuous; with subclavate to subcapitate apices; smooth; thin-walled; hyaline in KOH. PLeurocystidia not found. Pileipellis cellular/hymeniform; hyaline to brownish in KOH. REFERENCES: (Persoon, 1800) Schröter, 1926. (Fries, 1821; Saccardo, 1887; Smith, 1949; Ola'h, 1969; Stamets, 1978; Smith, Smith & Weber, 1979; Watling, 1979; Arora, 1986; Horn, Kay & Abel, 1993; Breitenbach & Kränzlin, 12995; Barron, 1999; Roody, 2003; McNeil, 2006; Miller & Miller, 2006; Trudell & Ammirati, 2009; Kuo & Methven, 2014; Desjardin, Wood & Stevens, 2015; Evenson, 2015; Siegel & Schwarz, 2016; Baroni, 2017.) Herb. Kuo 05179501, 06160211, 10040512, 05050601.